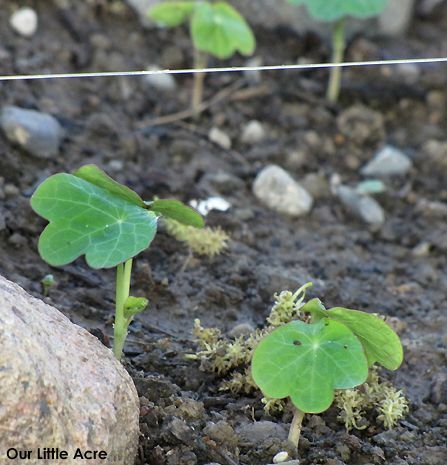 Our Little Acre: Seed GROW Project - Nasturtiums Are Go! Since spring decided to really and truly come early this year, my planting of annual seeds in the garden was able to get an early start, too. For the Seed GROW Project, I finally decided how I wanted to grow my Nasturtium 'Spitfire' seeds. Our neighbor pruned some rather large branches from his pear tree, and when I saw them laying in a pile by the burning pit, I asked him if I could use them for a trellis in my garden. He had planned to cut them smaller and burn them, so he said for me to take what I wanted. Romie pruned all the smaller branches off and evened up the lengths so I could make a trellis for the nasturtiums. It was simple - I just pushed the larger end into the soft ground, brought them together at the top, and secured it with twine. Then I took fishing line and wound it around the legs of the tripod trellis all the way to the top, to give the nasturtiums an invisible support as they grow. I placed some rocks we found in an adjacent farm field to put around the base of the tripod for more support. The neighbor who farms the ground is more than happy for us to take the rocks, since they are really hard on equipment. It's a win-win! On April 18th, I planted the seeds all around the trellis, which is in full sun, and watered them well. Germination is supposed to be 9-12 days, but since I planted them early, I wasn't sure how that might go. Mom and I left early on Friday morning (April 30th) for a weekend trip to the Tulip Festival in Holland, Michigan, so I hadn't looked at the planting site since the night before (11 days). Nothing was showing yet then. I have to assume that the extremely warm temperatures, coupled with the rain, made these shoot up shortly after we left, due to their size. They're off and growing! Love the twig trellis! We've had a ton of rain, too, and lots did pop up, most especially dandelions, lol! Looks like a great day here (sunny and warm), hope it is there, too. They're looking good, Kylee! Last year was the first year I planted any nasturtiums; I don't know why I waited so long--they're going to be a staple in my garden now. 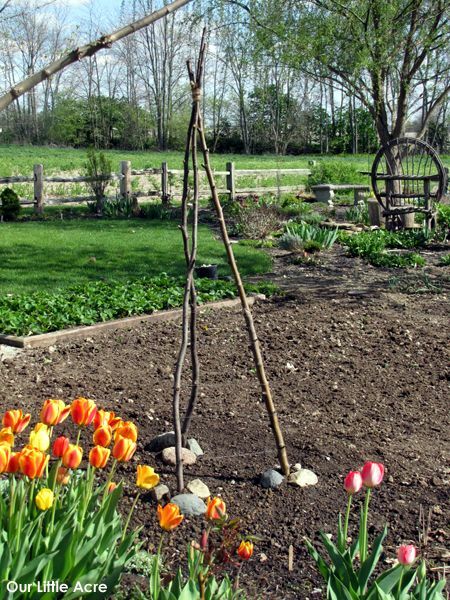 Great idea for the twig trellis. I like being able to use "found" objects like this in the garden. And I, too, have been collecting rocks from another farmer's field--they're making a great edging for one of my flowerbeds. I'll be makin a weed tree tepee for mine Ms. Kylee. Your little tepee structure should work great too. I've been usin weed trees for years to make all kinds of rustic garden features.